I know it looks like I've done very little hand stitching since my summer break, but it's not true! It's just that most of my hand stitching time has gone into my English Paper Piecing project, Texas Star. I'll be glad to see the end of that one! The big hold up on these has been the needleturn applique butterflies. You can see that I fussy cut the wings from a variety of Kaffe fabrics -- Roman Glass, Millefiore, and Paperweight. So that is a little trickier, but the main challenge has been the applique stitch. I want it to be invisible, and after some trial and error I settled on ladder stitch with 100 wt silk thread in light grey. I can't do more than one butterfly a day. And then I wonder if it's worth the effort, and that slows things down more. But, now that I look at it again, I do think it's worked well. In some light it seems to me that the Tsukineko ink that I used to paint in the design is starting to fade. I don't mind, because I do want the stitching to stand out. But as I write this, I'm thinking that maybe it's just the white fibres in the Kona PFD fabric that are starting to get fuzzy while I stitch. I will say the fabric is really holding up well to stitching. I don't use a hoop, and it hasn't puckered at all. Who knows? If the butterfly link up continues, I may get the next three blocks done too! Two butterflies per block. In the meantime, you can see a whole variety of butterflies in the Kaleidoscope of Butterflies right here. Gotta love that name! Thank you, Terry! The temptation was too great to ignore, again! Love the little glimpses of the millefiori fabric in the butterfly wings. Very pretty! I really like this quilt. 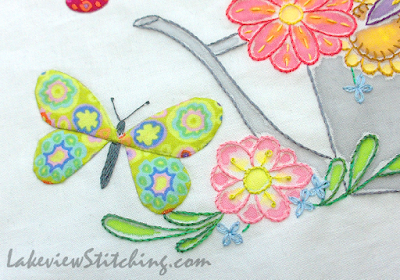 The addition of those applique butterflies is the perfect finishing touch to the block. What a darling project! I love the butterflies, the fussy cutting is just right. Monica, this is so adorable. 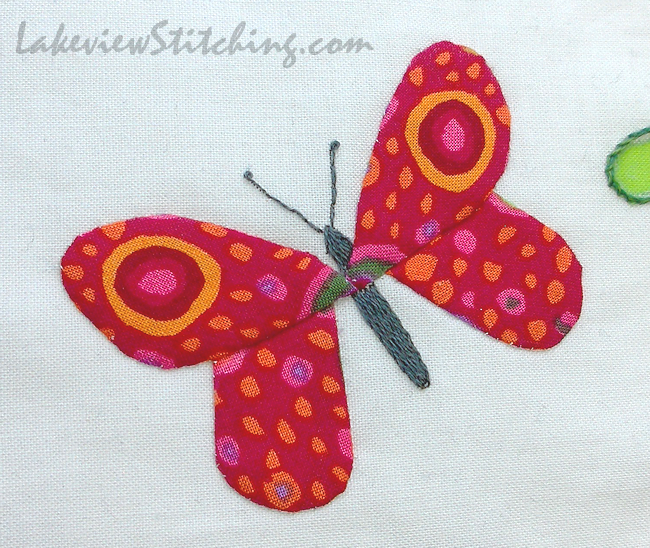 I love the way you pieced and appliqued the butterfly. Our last opportunity quilt was appliqued on front and inked with Tsukeneko inks. Yours reminds me of it. Love the thicker stitching you're adding. Thanks for linking this project with us. I hope to see more butterflies in future. Wonderful fussy cut butterflies - you must have excellent eyesight! 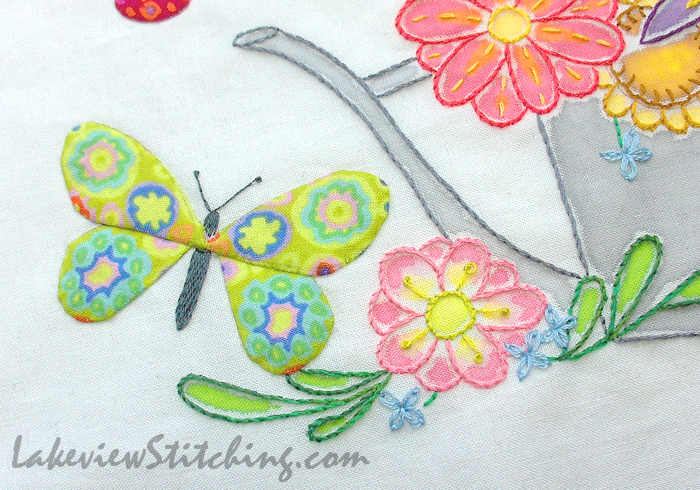 Keep appliquing the butterflies they add another wonderful dimension to the block. Your butterflies are awesome! I love how you fussy cut the wings. I can't believe the hold up was applique. Who knew? It looks perfect to me. I can't believe you don't use a hoop for the embroidery. 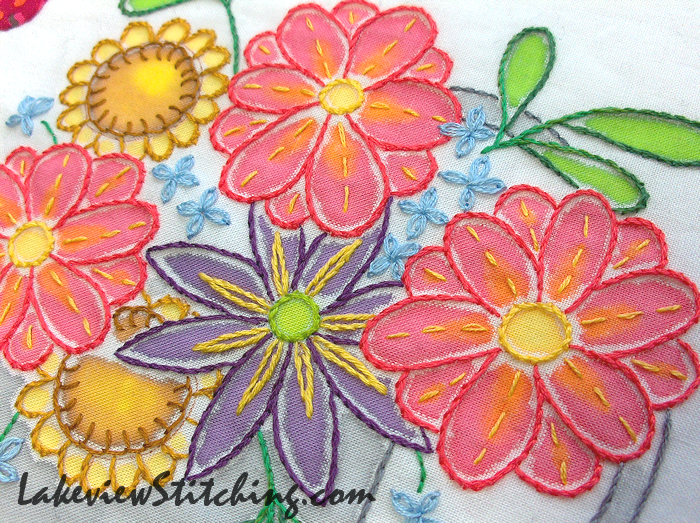 My embroidery stitches are uneven to begin with but without a hoop they are more than wonky. Congrats on moving ahead. 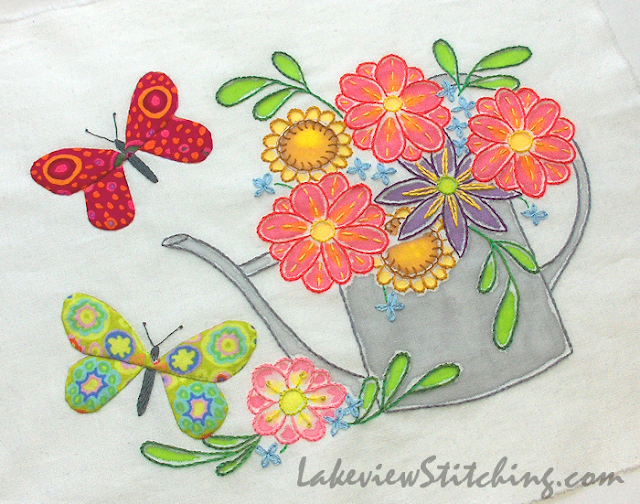 your butterflies are beautifully appliqued and liking the painting of the flowers. I love these butterflies - the fussy cut KF makes perfect wing patterns. You're right about the name - and you've chosen and cut your butterflies perfectly for the challenge. Well done! Thanks, Jillian! The link up and the butterflies were impossible to resist. But oh, I have too many projects here! Something has to give. Your butterflies are so delightful! So very pretty and the butterflies look beautifully done. Catching up on my blog reading. New wifi router set up yesterday which has eliminated the issues of intermittent service with the old one. Those butterflies are very nice and beautifully appliqued as well.